FLORIDA -- Bail was denied Wednesday in a Florida courtroom for a Palos Heights veterinarian accused of stealing two expensive show horses from southwest suburban stables last fall and a third from Florida about five weeks ago. Cathy Crighton, 44, has been charged with grand theft for allegedly stealing the horses and with dealing in stolen property for allegedly selling one of the Illinois horses to an unsuspecting buyer in Florida about two weeks ago. he also is charged with theft of saddles and equestrian equipment found in her Wellington, Fla., condominium and in a stable where she kept the stolen horses, according to police. Crighton applied Rust-Oleum paint to one horse's lower legs and face in an effort to obscure its identifying marks, police said. The horses were recovered in Wellington last weekend, and the two animals from suburban Chicago headed home Wednesday by horse trailer, according to their owners. Last Monday a Palm Beach County judge ordered that Crighton undergo a psychiatric evaluation. Results of an evaluation have not been made public. 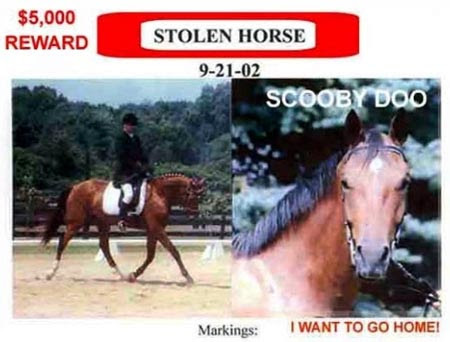 Crighton is accused of stealing a Swedish Warmblood horse named Keller from an Orland Township stable and a horse named Scooby-Doo from Wilmington in September, and transporting them to Florida, where she kept them in rented stables. On Jan. 21 she is alleged to have stolen a horse named San Diego from a stable in Wellington, an equestrian community in Palm Beach County. FLORIDA -- A stable owner in south Florida cautioned a veterinarian about yelling at people on an equestrian trail near the barn and wondered why she kept a horse under a blanket in 80-degree weather. But what really drew suspicion to the former Palos Park vet was trying to camouflage white markings on expensive show horses with Rust-Oleum paint. Cathy Crighton was charged over the weekend with stealing two horses in Illinois and a third in Florida, and dealing in stolen property for allegedly selling one of the Illinois horses to an unsuspecting buyer. She also is charged with stealing a horse trailer and two saddles. The two Chicago-area horses that disappeared in the fall were being prepared for a trip home by trailer on Tuesday or Wednesday. 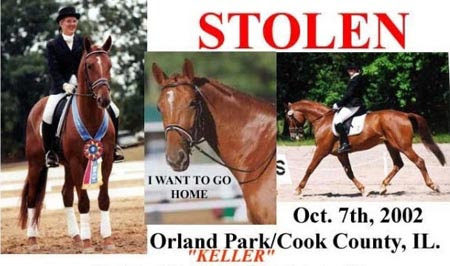 "I'm ecstatic, but I'm in shock," said Jolene Novak-Racevicius of New Lenox, whose horse Keller was stolen Oct. 8 from the Top Brass Horse Farm in Orland Township. "I'm happy to have her back, but I'm sad about the way she was treated. I was told she's underweight and very shy from being abused." 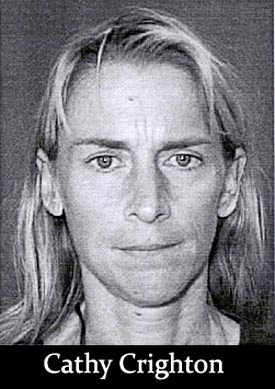 Crighton, 44, formerly known as Cathy Mance, was being held Monday in the Palm Beach County Jail in Florida. She was placed on suicide watch after she put her head in a toilet, sheriff's deputies said, and a county judge has ordered her to undergo a psychiatric evaluation. She is scheduled for a bail hearing Wednesday, sheriff's investigator Sgt. Michael Wingate said. He said Crighton admitted stealing a horse from a New Lenox owner but claimed she only picked up the other Illinois horse and the Florida horse when she found them wandering. Crighton quickly drew the attention of stable owner Sohail Shahzada, whom she approached Jan. 22, the morning after the Florida horse was stolen, saying she desperately needed a place for a horse that was being delivered that day from Chicago, Shahzada said. Shahzada noticed Crighton avoiding people passing near the barn on a public equestrian trail, he said. "Every night my neighbor passes my barn walking her Great Dane, and I noticed that Dr. Crighton got nervous every time she passed, and two or three times she screamed at her to get off the property," Shahzada said. "I asked her, please, don't scream at my neighbors, they are nice people and they are on a public path," he said. Within a few weeks Crighton brought two other horses to his stable, which were found to be the missing Illinois horses, he said. "One day I went out to the barn and found her putting Rust-Oleum paint on the horse's face, with a brush. Now that just didn't make sense. I'm no expert on horses, but I know what Rust-Oleum is for, and it's not for horses," Shahzada said. Wingate said Shahzada was surprised by Crighton's poor treatment of the animals and became suspicious when he heard that a horse had been stolen nearby. He found the missing horse's trainer, who identified the horse, and police were called, Shahzada said. FLORIDA -- A veterinarian from Palos Park has been charged with stealing three expensive show horses from suburban Chicago and Florida, according to a spokesman with the Palm Beach County records office. Cathy Crighton, 44, was arrested Saturday in Wellington, Fla., while trying to use black enamel paint to cover distinguishing white marks on the legs and faces of the animals, Palm Beach County investigators told the South Florida Sun-Sentinel. Among the horses recovered was a $50,000 Swedish Warmblood named Keller, which was taken from a stable in Orland Township last fall, officials said. Crighton's bail was set at $5,000. She remained in the Palm Beach County Jail Sunday and has been charged with burglary of a structure and grand theft. Crighton had cared for Keller, which belonged to Jolene Novak-Racevicius', before the award-winning horse was stolen in October. Shortly before the theft, the two had a falling out, Novak-Racevicius said, "so I decided not to use her any more." When police went to Crighton's home to question her, Novak-Racevicius said, the veterinarian had her home up for sale and had left the state.